When you want to inform a market about the goods or services you offer, you give them any way to see your brand. Brochures, flyers and posters are all marketing materials you utilise to inform the market. But what do you do when your market is located internationally? What if it is located in a foreign country? The obvious answer is translation. If you have a brochure in English and your desired audience speaks French, you should translate the brochure to French. It’s a no-brainer. But what if that brochure includes some English slang or a reference to English pop culture? You can’t just translate it into French. The translation would be nonsensical. This is where the no-brainer starts to require some brains. You are going to need to utilise localisation to adapt your translation. Linguistic is the translation aspect of localisation. Every piece of marketing material shown to a customer who does not speak the original language will need linguistic adaptation. This is usually the majority of the localisation process. But it is not the only aspect that affects the product or service. Format is vital in this aspect of the localisation process. A client may require modification to support features of a particular language. For example, Arabic languages write their text from right to left. Clients would require a unique format for a localisation to an Arabic country. Physical issues would involve applying manual adjustments to the pieces of marketing material in order to be appropriate for a local market. These adjustments can take a substantial amount of time and money when localising a piece of marketing material. While it isn’t essential for the majority of documentation, physical changes may impact the original . For example, if your brochure was made with high quality paper, a country who’s middle class used lower quality paper would not gel with your brochure. Business and Cultural issues is another vital aspect when it comes to localisation. If a company would want to make a true connection to a specific market, the use of a local address and phone number is essential. A client will trust a local address, as well as feel like they are helping a local business. Other aspects of adaption would include changing colours and graphic to meet cultural norms, as well as an awareness for local cultural expectations. For example, some countries do not have the use of credit cards so a company must not advertise their use of e-commerce. 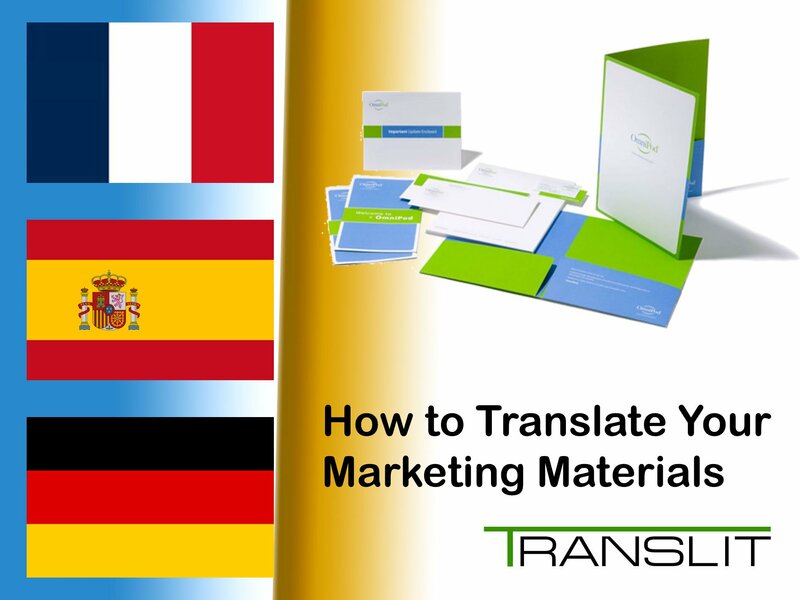 When these issues are considered and dealt with, a piece of marketing material is translated, localised and ready for distribution in your desired market. We at TRANSLIT understand the importance of an accurate localisation. As a complete language service provider, we provide both translation and localisation services. We are proficient in both of these services, so our localisation is always at a perfect standard. Contact us for a quote today!